Algoma Orchards, located in Newcastle, Ontario, is no rinky-dink farm. In fact, it's the largest privately owned grower and packer of apples in Canada. The company maintains 750 acres of trees, a packing plant and a juice factory onsite, and imports apples from Chile in order to maintain a year-round supply. The company also conducted a test last summer of an Internet-controlled pest-management system that is simultaneously high- and low- tech. The technology, developed by Vancouver-based Semios, is high-tech because it uses networks of sensors, cameras and communications equipment to protect orchards, vineyards or any high-value crop from highly destructive pest insects. However, it's also low-tech, since the manner in which it controls those pests is by releasing pheromones to confuse and disrupt the inserts' mating rituals. The Semios pheromone dispenser contains an IEEE 802.15.4 wireless radio used to link it to the Semios software hosted on a central server. Algoma's farm manager, Manus Boonzaier, isn't particularly concerned with how high or low the technology deployed on the farm might be—he only wants it to work and to help him run the farm more efficiently. "Up until now, we've been fairly conventional," explains Boonzaier, referring to the farm's practices, which include the use of chemical pesticides and other practices that are prohibited on farms operating under organic farming standards. "But we try to minimize pesticide use due to the high cost [of pesticides] and the long re-entry period." Re-entry refers to the amount of time that farmers must stay out of a freshly sprayed field or orchard, under mandate from Canada's Ministry of Agriculture, due to the toxicity of certain chemicals. After applying some pesticides, farmers cannot work in an affected area for a full 30 days. Because pesticides are sometimes applied during a period of fast growth within the orchard, Boonzaier notes, this can be a problem since it does not allow him and his crew to perform the hand-thinning necessary to maintain optimal tree health. 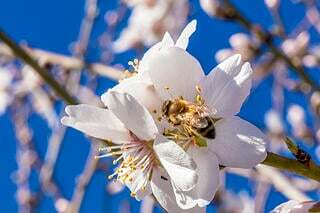 Using pheromones instead of pesticides to control pests is one way to enable greater accessibility for hand-thinning, Boonzaier says, but pheromones applied at Algoma have not proven as effective as pesticides. He believes that is because the pheromones are packaged in wax, designed to soften in sunlight and expel the pheromones over a period of 90 to 120 days. By design, these release the highest amount of the pheromones mid-day, since the bottles heat up in the sun. But for codling moths, Boonzaier says—significant pests in Algoma's apple orchard, and in most apple orchard everywhere—"it's the nighttime when you need to get at these moths." Algoma Orchards is testing Semios' technology as part of a three-year grant program that Semios was awarded by Sustainable Development Technology Canada, which supports the development of environmentally friendly technologies. Last summer, to monitor and control the farm's codling moth population, Semios installed its camera-equipped insect traps, wireless sensors and pheromone dispensers across a 35-acre section of the orchard. No insecticides were used in this section. A 30-acre control section was sufficiently distant so that none of the Semios pheromones would enter it, and none of the pesticides used in the control section would contaminate the section in which Semios' technology was being evaluated. The camera traps monitor for pests, sending the images daily via a low-power network built on the IEEE 802.15.4 protocol to Semios' gateways installed in the field, which then forward the images to a Semios server over a cellular network. 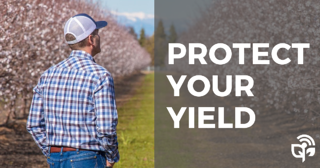 Farmers conventionally place codling moth traps throughout their orchards. A pheromone that attracts male moths is emitted from inside the traps, and a farmer manually checks the traps roughly every two weeks, says Michael Gilbert, Semios' CEO. This gives them an idea of how many of the moths are present in the orchard. Once a critical threshold is reached, they decide whether to spray an insecticide, pheromones or both, in order to control the moths. By logging onto the Semios software via the Internet, however, farmers can check the traps daily. "That granularity allows us to make real-time decisions" and respond to the moths by beginning to spray pheromones as soon as that critical threshold is reached. The pheromones are mating triggers for the male codling moth. Essentially, when they are sprayed throughout the orchard, the male moths go into sensory overload, stymieing their search for a mate. In that way, the population can be controlled. The Semios moth trap contains a camera that takes images of the trap's interior daily, and then forwards the image to the Semios software. Once the decision to spray is made, Semios triggers its remotely controlled pheromone sprayers by sending the command over its cellular link to the gateways on the farm, which send the commands to the individual sprayers via the local network. Spraying generally takes place at night, when the moths are active and looking for a mate. 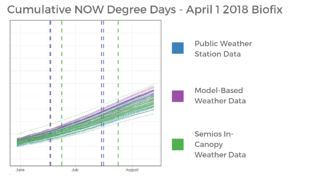 Semios also installs a weather station at each farm in order, to determine whether high winds or low temperatures will likely keep codling moths from traveling. In those conditions, the pheromones are not sprayed. The Semios system worked so well, Boonzaier says, that he did not need to apply any pesticides in the Semios block to control pests last summer. The control block, in which no pheromones were used, did require pesticide applications. Gilbert says Algoma was one of more than 50 farms across Canada—mostly apple orchards—that were involved in the grant program. 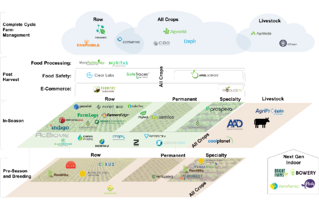 "The goal is to de-risk the adoption of our technology for farmers," he says, and to provide tangible results to farmers to hopefully convince them to invest in the Semios system. 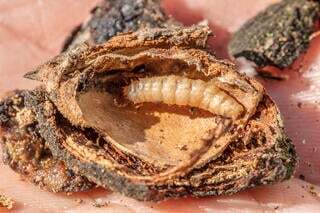 According to Semios, the company has already deployed its pest-control systems for moths and other insects at 150 sites throughout Canada, the United States and the European Union, including three of the top five largest tree fruit, nut and grape farms in the United States. The firm charges an annual fee of $150 per acre, which includes all use of equipment, software, data and pheromones.